"It's a perfect place to put all of your creative energy and ideas, and give it the best way possible to your fans," she tells E! News' Erin Lim. Noting on Instagram that it's going to be a "multisensory escape to a world of magic." On the topic of collaborations, which Aguilera says she loves doing with other artists, she hinted at a possible Britney Spears collab. Considering both pop stars will be performing in Sin City—the "Toxic" singer currently has a residency in Vegas—it doesn't seem like a far-fetched idea. 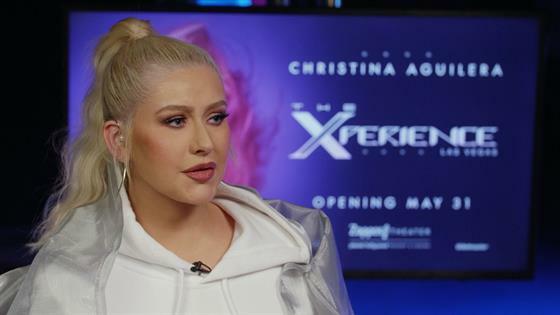 "We're in Vegas, it's inevitable," Xtina tells E! News. "There's so much history where I'm going and I just feel like calling up all those girls—Lady Gaga is the newest one there. I wanna get the real scoop from all of them and be like, 'What's it really like?'" Playfully throwing in, "Let's bring all of our forces together and make this happen." You hear that ladies? Be sure to pick up the phone for all of your fans' sake! Jokes aside, even if Gaga and Britney don't collaborate with Xtina, the pop star reassures her fans that her kids, Summer Rain Rutler and Max Liron Bratman, will definitely get on stage with her. "I'm sure there will be moments where they will not let me live it down if I don't bring them on stage, but they aren't planned entertainers on the show. We're a very spontaneous family." The six-time Grammy winner says she's "excited" for her show, and is "constantly accumulating ideas" for it. "Vegas is a place you want to escape, and forget about your job and everything you feel like you have to be for somebody else, the night that [fans] come to see the show, I really want to take them away from any of their problems," she tells us. Best believe she's also implementing songs her fans live for. "I like to cater to songs that I know my fans will be able to enjoy." Even better? She's open to music suggestions. "My ears are open and I'm really listening to what my fans want to hear. I think it's important to be there for them."